Owing to our proficiency in this domain, we are offering our clients with a broad gamut of Moire Mosaic Wall Tile. Piccolo Mosaic Limited was established in the year 2000. 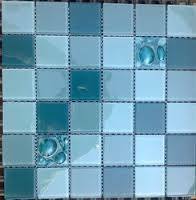 We are the leading Manufacturer, Supplier, Exporter of Italia mosaic tiles are used for wide applications in homes, offices and public places. They add an aesthetic touch to exterior as well as interior decoration. They can be creatively used in bathroom, dining hall, entrance wall, lobby, staircase, pillar, dome, swimming pool, fountain, religious places, public places etc. It is available in 47 vibrant shades. It adds great value to the exterior as well as interior surface in terms of durability. Italia glass mosaic has been tested by government-approved labs and found to be water - weather - chemical - fire proof and resistant to thermal shocks. They retained their original colors for very long time. This is very important for us because our clientele is more demanding. Their concepts of a building are more enhanced by their wide exposure to various lifestyle products. This is further enhanced by tendency to explore new ideas.